Donald Lawrence Kowalski, age 72, passed away on February 9, 2019. Donald was born on January 26, 1947 to John and Genevieve (nee Romanowski) Kowalski. As a young man, Donald proudly served his country in the United States Army. After the Army, Don earned his Bachelor’s degree at Lawrence Tech and worked for many years at Kroger as a Deli Manager, where he would go on to retire from. Donald was a fun-loving person, who was always up for a good time. 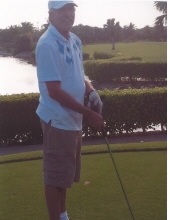 He especially loved his trips with his family and golf outings with the boys. Beloved father of Melanie Drake; dearest brother of Stanley, Gary, and John; proud Papa of Tyler, Alexis, and Brittany. Also survived by his best friend Jake, favorite son-in-law Robert, and future son-in-law Kris. Preceded in death by his parents, John and Genevieve Kowalski. Visitation on Sunday, February 17 at Lee-Ellena Funeral Home from 2-8PM. Memorial Service at 7PM. To send flowers or a remembrance gift to the family of Donald Lawrence Kowalski, please visit our Tribute Store. "Email Address" would like to share the life celebration of Donald Lawrence Kowalski. Click on the "link" to go to share a favorite memory or leave a condolence message for the family.